We want your responses. We want you to think how the emails might be used and how the basic format could have additions to suit different circumstances. To give you an idea of what I’m talking about, requests have come in for materials based on the Wisdom Works themes that might be run in different settings including lunchtime groups and day sessions. There have also been requests for a form of the reflections that could sent round the office. What we are looking for is anything which will generate a desire to pursue wisdom. 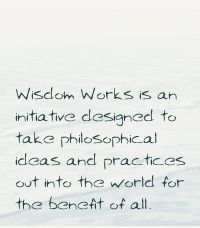 Do you subscribe to the Wisdom Works newsletter?